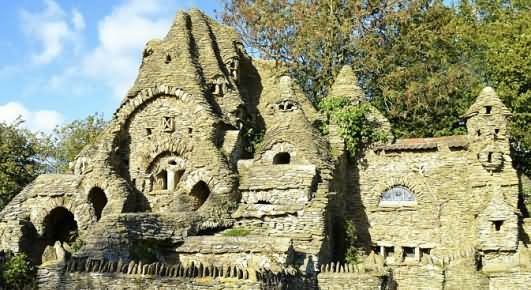 A Sheep Farmer spent 11 years building a Hobbit's house, near Chedglow in Wiltshire, for sheltering his sheep and hay storage. This 'Hobbit House' was built without planning permission by a local eccentric artist, as a sheep shed. It started as a simple single height building but grew and grew. It took over ten years to build using stone from the nearby fields. It is so well hidden that council did not know about it, but when they did find out the artist was told to stop. This was in the late 90's and the artist just stopped and moved to Scotland, leaving it unfinished. Please note the Hobbit house is located on private property which is not open to the public.